When It comes to life lessons, it seems that the youth have it made, at least in literature aimed at them. As adults the only ones that seem to offer advice are those who have a slant or an issue to press. 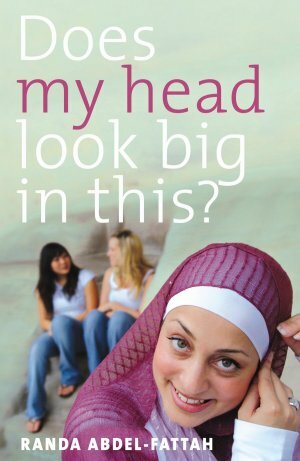 This book, “Does My Head Look Big in This?” offers up a dose of reality when it comes to multi-culturalism. Anyone who has been through them can tell you, the teen years are not the easiest of times to get through, you’ve got peer pressure, body & hormonal changes and pressure to decide what you are going to do with your life. Imagine all that and then one day some people that claim your religion as their cause decide to destroy a couple of buildings in New York. Now the entire world looks at your religion as evil. Even worse live this as a High School student. That is just what Randa Abdel-Fattah has offered up in this book, a look from a typical Muslim girls eyes. Amal Mohamed Abdel-Hakim is a sixteen year-old Australian-Palestinian-Muslim girl living in Melbourne with her mom and dad. Her father Mohamed drives a metallic-red convertible because he’s convinced that he’s still young and cool, he fails to remember that he has a receding hairline, and he blasts Italian opera or ‘Palestinian Folk’ songs from his car stereo system. Her mom’s name is Jamila, which means beautiful in Arabic. She’s loud, fun and energetic, loves to laugh, and is neurotically clean. Just before starting her 11th year in school she makes the decision to adopt the Muslim custom of wearing the hijab, the head covering traditionally worn by Muslim women, with varying reactions from her family and peers. This book is about those reactions. She gets support from one of her Muslim friends, who also wears the hijab, but her mom and dad are worried about what she will have to go through. With the terrorist attack of 9/11 not quite a year past, the world looks at Muslims with suspicious eyes. Logically thinking Amal goes by the the premis that a small group of fanatics shouldn’t condemn a whole religion, a very peaceful religion at that. After all are all Christians hated because of the Ku Klux Klan or the Nazis, they were all Christian based. Too bad the world as a whole does not think logically. At first her small group of friends think she is forced to wear the Hijab and feel sorry for her, after she makes it clear it is her choice, some begin to approach her out of curiosity and realize she is the same. To give a little slice of the world some of her friends include, a Japanese girl, an Aussie girl with body image issues, a Greek Orthodox woman that came to Australia not speaking English and more. This book not only deals with the typical problems of the teen years but also shows a very eye opening view of a religion that is misunderstood. The reader, Rebecca Macauley, does a smash up job of reading this book, she does a great job of portraying the various accents and cultures. Just to give you a hint of what verbal gymnastics she has to go through, she has to portray an Australian Muslim, then also some Pakistani, Orthodox Greek, British Cockney and even American accents. She does a great job delivering the story and manages to express all the emotions on this roller-coaster of life view. Just got this book and I cannot wait to read it!! Great review!